RBKC’s planning committee unanimously voted to grant planning approval for our Vicarage Gardens project. The project is a handsome four story house plus attic, we have been appointed to reconfigure the internal layout, add bedrooms and a basement. We’re looking forward to starting this exciting project in the spring with our fantastic team, keep an eye out for more information on this project in the coming months. 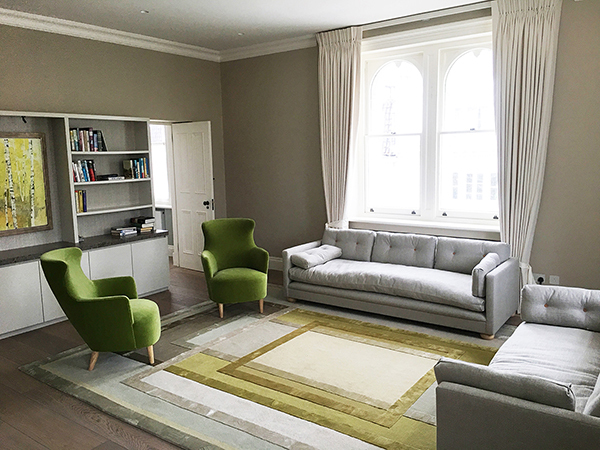 We are thrilled with the completed look of our Cornwall House project in Kensington. Please head over to our ‘Completed projects’ section to see the full description and project photos! Nash Baker Architects have been granted planning approval for the internal refurbishment and rear extension at a three storey family home in the Highgate conversation area of Harringey. The property was suffering from historic low quality extensions and an internal layout that felt disconnected from the garden. The proposed layout features an open plan kitchen and dining space, more conducive to family living. The property on Southwood Avenue will have a new extension to replace the the current one with a roof light and glass folding doors to increase the connectivity between in the indoor and outdoor space. Nash Baker Architects were appointed to complete a full internal refurbishment at a Grade II listed building in London's Kensington. 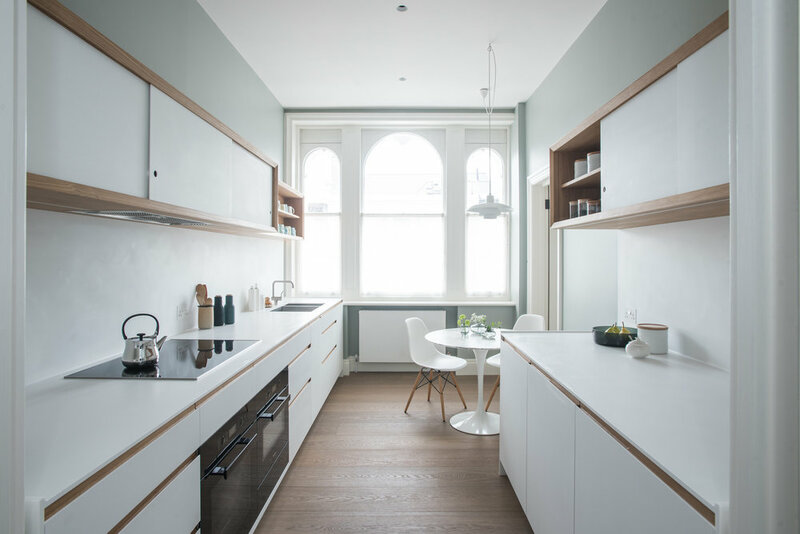 We worked with Jack Trench to deliver our client a beautifully finished fitted Kitchen in American White Oak and Corian. We have been granted planning consent to carry out a full internal refurbishment and extension of a grade II listed building in Bow, East London. The three storey mid-century Georgian townhouse is due to be transformed with it's current historic layout reimagined to create an open plan living space on the upper ground floor, additional living spaces to the lower ground floor and a new beautifully landscaped garden. Planning has been submitted for a new family home to be built in the West End conversation area in Esher. The clients, a young family, set their brief to create a family home which maximised space and light with sustainability at the forefront of it's design. The proposed two storey home built in red brick with contrasting vertical black timber, will utilise building materials and techniques to minimise it's carbon footprint, length of build and disruption to neighbours. Nash Baker have submitted a planning and listed building application for a grade II listed building in Little Venice. The proposal seeks to convert the current four flats into a single family dwelling, retaining the historic stucco finish while an exciting two storey crittall style extension is built at the rear of the property. The final interior fixtures and fittings are being installed in the Grade II listed, Kensington apartment refurbishment project by Nash Baker. We look forward to sharing the full project photos with you soon. Nash Baker architects are excited to be appointed by a repeat client on a refurbishment and basement extension project in Knightsbridge. Nash Baker have been working on proposals for a new housing development in Suffolk; which harmoniously works within its site context, and utilises a palette of local materials. This exciting mixed-use development aims to provide a broad range of housing options in this attractive rural location. Works have recently drawn to a conclusion on the full refurbishment of a 1,500 sqft Grade II listed apartment in Kensington. From appointment to handover, the project was completed within 8 months, and to a very high standard. We look forward to sharing the full project photos with you shortly. Works are now drawing to a conclusion at our careful 3 year restoration and extension of an exceptional detached Grade II listed property in Bedford Park (pictured). Also completed this year was the creation of a new basement with full refurbishment of a Wandsworth townhouse, the demolition and rebuilding of a Notting Hill townhouse, and two large apartment refurbishments within grand listed Chelsea mansion blocks. Works have just started on site for the creation of a new basement with swimming pool, and full renovation of a handsome Grade II listed property in Brompton Square, SW3. This complex and innovative design will be on site for some time, and we look forward to sharing the results with you.